One of the most unique bulls to come out of Ter-Ron in recent years. Real Deal has everything we are looking for in a herd sire. Depth of body, stoutness, very good footed, structurally correct and has a dark, rich hair coat. 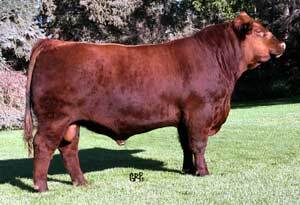 Sired by 2009 Canadian National Champion, Red Ter-Ron Reload 703T. 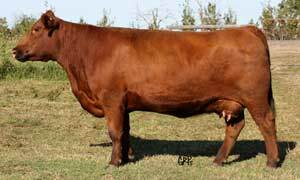 His granddam is the famous Brandy 11C cow, who we could write volumes about. Also check out the sire to his mother - the DMM Flex bull, from Miller Wilson Angus. Outcross genetics here. Real Deal has had quite a show career in '09 and has never been beaten as of yet.